Although Korg and his sidekick, Miek, played a large role in Thor: Ragnarok, they were nowhere to be seen when Thanos and his children attacked. Avengers: Infinity War neglected to reveal the fate of Korg, Miek, or even Valkyrie; but we strongly suspect that all three will turn up alive at some point in the Marvel Cinematic Universe. In the meantime, Thor: Ragnarok director Taika Waititi has reprised his role as the soft spoken Korg for Marvel’s new Contest of Champions motion comic. Considering that Korg considers himself a revolutionary, it should come as no surprise that he’s once again planning an uprising. 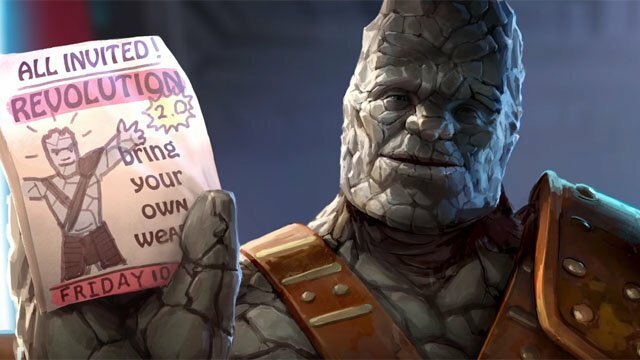 This time, Korg has apparently learned from his mistake and printed enough pamphlets for the revolution. However, the turnout is somewhat less than desired. Miek, Valkyrie; and a three-headed alien were the only ones to answer Korg’s call to action. However, the perpetually friendly Korg counts the three-headed alien as three separate attendees. That may make this his most successful revolution to date! In the Revolutions 2.0 motion comic, Korg explains why Miek is missing his signature exo-suit. The short also introduces the original Doug, whom Korg mentioned in Thor: Ragnarok. Sadly, Doug has a terminal case of death and won’t be available to join Korg’s “re-revolution.” Korg also selects two familiar faces from the MCU to join his cause, but he rejects the most suitable candidate because of perceived class issues. Korg’s final recruit is a villain to his core, but Korg doesn’t judge him by his physical appearance. Perhaps in this case, he should have. Watch the full Contest of Champions motion comic below and let us know what you think about Waititi’s return as Korg! The post Taika Waititi Reprises His Role as Korg in Contest of Champions Motion Comic appeared first on ComingSoon.net.